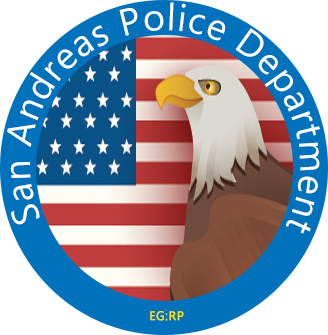 The San Andreas Police Department consists of ten (10) different ranks, divided into five (5) different classifications for their duties; they are as follows. After an applicant has completed the recruitment process and filled out the necessary paperwork, they will join the department at this rank. Cadets are expected to go on MPS (metropolitan parking services) duty if they are unable to patrol with an officer. Cadets may not issue tickets or perform arrests without the consent of an Officer’s approval. Upon completing the Cadet to Officer Exam, the Officer will be transferred into the Patrol Operations division and will be eligible to join a division. Officers are permitted to patrol alone, however if a Cadet is available then they are required to take them. The rank of Corporal will be awarded to an officer that has shown a great amount of competence and are a candidate to become a Sergeant within their division. Corporals have the same duties as Officers, however they have the ability to supervise other units. They may not issue disciplinary action, however they can take corrective action over the actions of an Officer. The rank of Sergeant is chosen by the relevant divisional Lieutenant. Whenever a Sergeant is on-duty, they are a shift supervisor. In the case of multiple Sergeants being on-duty, the first assumes the role of shift-supervisor. When the shift-supervisor leaves, the role goes to the next Sergeant on-duty. Being the shift supervisor, it is up to the sergeant to make sure the patrol units are organized and are functioning in an efficient manner. Sergeants are permitted to submit disciplinary actions, assign alternative punishments, and reassign patrol units. Sergeants are required to take a Cadet on patrol with them if there is any available. The rank of Lieutenant is the first rank considered Command. Lieutenants serve as the director of their division and have the ability to remove people from their division as well as promote or demote people within it. They are not permitted to suspend or terminate officers without the approval of High Command, with the exception of the Internal Affairs Lieutenant and the Field Training Operations Lieutenant, who may terminate Cadets. Captains are the first rank considered High Command, and they assist the Commissioners in running the department. They have the ability to terminate anyone in their jurisdiction while also having the ability to promote and demote members within their jurisdiction. There is one Deputy Commissioner. The Deputy Commissioner is responsible for ensuring the department as a whole is running smoothly alongside the Commissioner. They have the final say in any decisions regarding the department, and are able to overturn any decision made by another command member except that of the Commissioner's. The Commissioner is responsible for ensuring the department as a whole is running smoothly. They have the final say in any decisions regarding the department, and are able to overturn any decision made by another command member. All personnel in the department are required to have a personnel file created, regardless of their current rank within the department. All promotions, demotions, disciplinary actions, or changes to the member shall be noted on their personnel file.